This has been on my bucket list for 20 years, and with the opportunity to hang out with some new friends I set out on my journey from Arkansas. Of course they were calling for 70 mph winds, heavy snow, and flash flood conditions when I arrived, so I figured my chance to photograph firefall was slim, but I still had to try. I arrived on the day before at 5 only to catch it a slight glow, and was happy to get a glimpse. With 6 days still to go I got another opportunity the following day, and it did not disappoint. It lit up like lava pouring from the heavens, and continued to do so for 30 minutes. 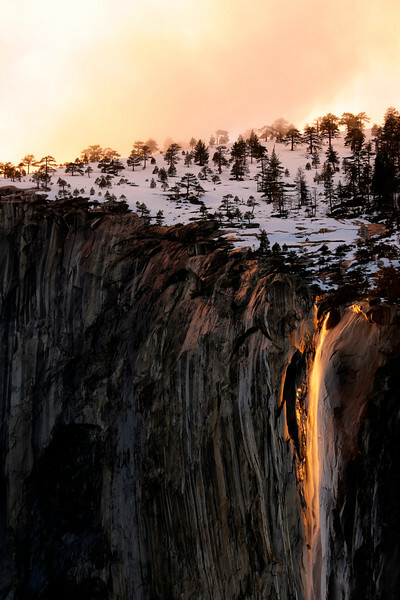 Horsetail Falls drops 1,000 feet and only for a few days in February does it put on its amazing show. Since Yosemite had received lots of snow and rain before my arrival, it put on one of the best shows with the waterfall at full flow, and fulfilled a dream that I had waited 20 years to complete.